I've always wanted to visit Vancouver as I think of it as a little bit of England. I've yet to visit, but after reading this great little book of the Top 10 things to see and do, I'm just about ready to depart. Being virtually surrounded by water means there are lots of bridges to cross to who knows where. You can stay in the city with all its buildings or escape to the wilderness for a change of pace. 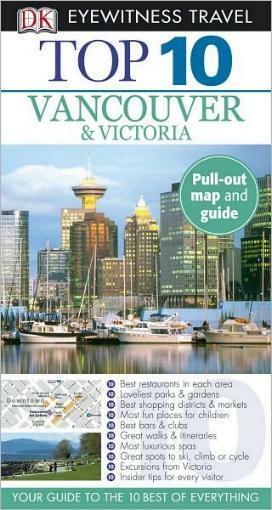 Or, you can opt to just explore Stanley Park, almost in the city. Like most modern cities, there are museums to be explored, art galleries, markets, walks, restaurants, spas, and shopping to be had. There is also an abundance of wildlife and wilderness areas to investigate, as well as things for the kids to do. Do check out the festivals — there may be one you'd like to coincide with your visit. One doesn't usually, as I didn't, associate beaches with Canada, but surprise, surprise, there are many beaches around Vancouver which beg to checked out. There are also a few walking tour suggestions in this book which are helpful especially if you're partial to strolling around. There is a lot to see and do in these two very picturesque places, and it seems as though there's more than enough to keep you busy. I found this guide very enticing and I can't wait to visit this part of Canada, armed of course with this helpful and compact (just what you need) guide book. Particularly helpful are the Budget Tips for those of us who don't have much to spend but still want to enjoy sightseeing and other touristy things. As usual, there are many wonderfully inspirational photo illustrations; what you'd expect from these delightful DK guides. A pull-out map and maps inside the covers are also included. Conclusion - Another fantastic bargain of a travel guide; full of great things to do and see and eat!